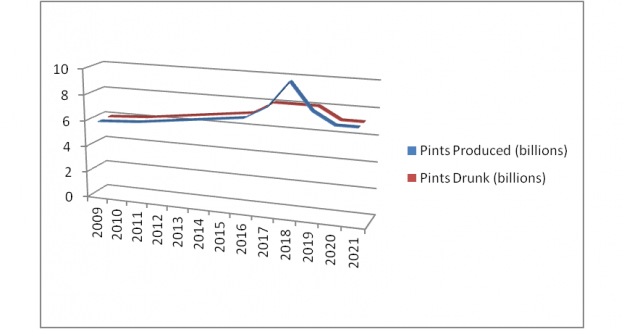 1st April 2018 @ 9.42am is Peak Ale, not the theorized, but actual point in time when the amount of beer produced is greater than existing UK drinkers are able to consume. With micro-breweries popping up everywhere and even long forgotten beer brands such as Lacons in Great Yarmouth being brought back from the dead the difference in beer production will continue to outstrip consumption unless we act now – for this is our Light Pale and Darkest Hour and we at the fourtharch shall not flagon or fail. We shall go on to the end. We shall drink in the churches [Hanborough beer festival February 2018] we shall drink near the seas and oceans [The Sloop St Ives August 2013] we shall drink with growing confidence and growing strength in the air [Flight to Prague August 2010] we shall defend our beer, whatever the cost may be. We shall drink on the beaches [Cove House Inn Portland September 2010] we shall drink on the landings, in the bedrooms, kitchens and bathrooms we shall drink in the fields [Fur & Feather Woodbastwick this September] and in the streets [The Nutshell Bury Saint Edmunds but with one arm still inside the pub September 2011] we shall drink in the hills [Tan Hill Inn] we shall never surrender, and if, which I do not for a moment believe, this island or a large part of it were subjugated and completely overwhelmed with beer then we will ask Ryanair to bring back from our Empire beyond the seas as many boozing Ibiza Weekenders as possible by stripping out the seats on all Ryanair flights.That last suggestion was part of this morning’s practical joke but I see Michael O’Leary has already put the idea forward for real! This entry was posted in Uncategorized on April 1, 2018 by fourtharch. The second annual unofficial Fourtharch.com splinter group tour of Oxfordshire was an outing to the Church Hanborough Beer Festival held in Saint Peter and Paul’s Church Hanborough organised by Emma the vicar who just happens to be married to fourtharch member Chris. A wife who organises beer festivals surely means Chris is living the dream. Although this new Fourtharch.com tour is non-compulsory the journey still began at Heath High Level and good thing too as I don’t know how I would have gotten up onto the platforms at Cardiff Central station for my train to Oxford what with thousands of Welsh rugby fans streaming into Cardiff from the South Wales valleys for the beginning of the 6-Nations! I still had to fight my way through a sea of red rugby shirts for my train to Oxford that was on time, however the connecting train for Hanborough was cancelled. The solution to cancelled trains these days is to put rail passengers into taxis and the helpful staff at Oxford station soon had me sharing one with a young man and his Irish girlfriend who were also Hanborough bound. Before leaving the railway station I had established that my new young travelling companion was a Welsh rugby fan and desperate to get home to watch the match about to kick off back in Cardiff but as our journey slowly progressed I began to notice a number of characteristics in this young fellow similar to that of Fourtharch.com member Gez. He was slight of build with a face full of colour and constant wonderment, he talked at the same speed as Gez and also claimed to be Welsh even though only half on his father’s side. That’s where the similarities ended because whereas Fourtharch.com founder member Gez sees the world full of numbers that add up this young man did not. The journey by road was proving to be a slow one as we joined one traffic queue after another but I was kept well entertained with a list of precise reasons why trains on the Oxford to Moreton-in-Marsh line suffered cancellations. Then followed an explanation for the alternative taxi timetable system that sent passengers the furthest to travel from Oxford first with all those for Hanborough sent last and even though we had set off a good 20 minutes before our scheduled train it was not making this young man any happier. Things were about to get a whole lot worse as we approached another obstacle and obvious bugbear for him in the shape of the Swinford toll [10 pence] bridge where he suddenly began to lose it and transformed from Gez into Mogi. The Swinford bridge was granted a toll in perpetuity by George III because, as my young travelling companion who was now stamping his feet and bringing his hands up and down on his lap exclaimed, “Because the bloody King fell in the river, resulting in queues of traffic in and out of Oxford everyday”. I don’t know if he seriously believed that George III, or Hopeless the First as he preferred to call him, actually fell into the Thames on purpose just to screw up someone’s life two centuries into the future, but I managed to calm him down by bringing up the name of Michael Portillo – that I wish I had not and any fans of Great British Railway Journeys colourful frontman should stop reading now. The young man excitedly told me that he actually saw the former Tory politician sitting on a train wearing his full coloured jacket and trouser uniform – the young chap, a fan of Great British Railway Journeys, [although not the railways themselves] had to speak to his television hero so went over and asked him “Excuse me Sir, is this carriage E?” to which Portillo looked up glaring sternly at the young chap and barked “F” quickly looking back down again presumably to study his Bradshaw’s. I did not have time to find out if Portillo left out the “off” at the end of “F” or if he was actually sitting in carriage F, but how rude of Mr Portillo and disappointing for the young chap. My two travelling companions got out of the taxi on the main road in Hanborough while I continued to the railway station and the meeting point for Richard and Matt where I was thrilled to read that Hanborough rail station was the final stop for Sir Winston Churchill’s funeral train back in 1965, so I took a moment on the empty platform for quiet contemplation and to thank the war time Prime Minister and national hero for 72 years of continuing peace. Our B&B [formally the Swan pub] was located in long Hanborough just over a mile away where we parked up and were then stopped making our way to the Three Horseshoes pub across the road by Chris and Emma who invited us into their new home just opposite. 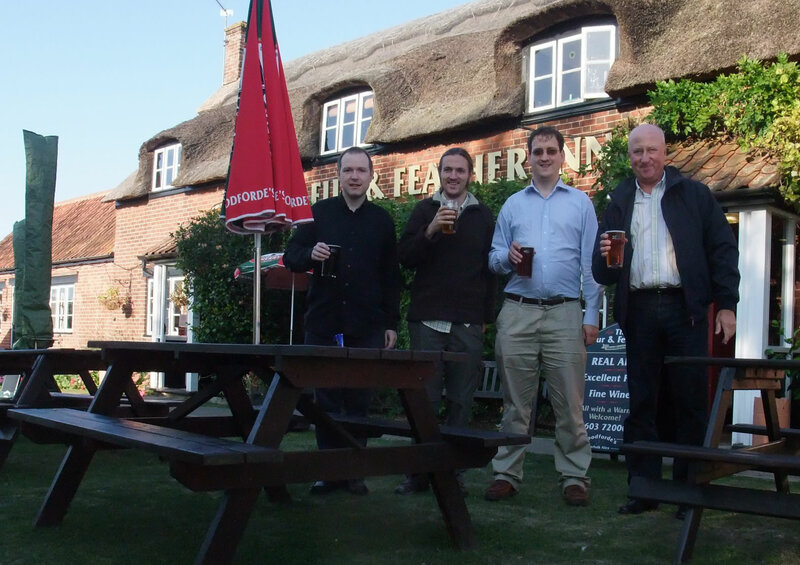 A wife who organises beer festivals and a pub opposite your front door – Chris, you are now being greedy. It was 3pm, so while Chris and Emma headed back to the church it was time to check in to our B&B that was similar in set up to the Kings Head in Masham back in September with chalet style rooms built into the old outer houses. We had difficulty finding the front door to the main house so I waited at the garden gate while Richard and Matt investigated and, seeing the door open and them both ushered inside, I walked down the garden path and entered to be met with the sight of Richard and Matt carrying a shower base across the large entrance hall while our B&B lady advised us all to avoid and ignore opened boxes of tiles laid out across the floor like some sort of art installation. 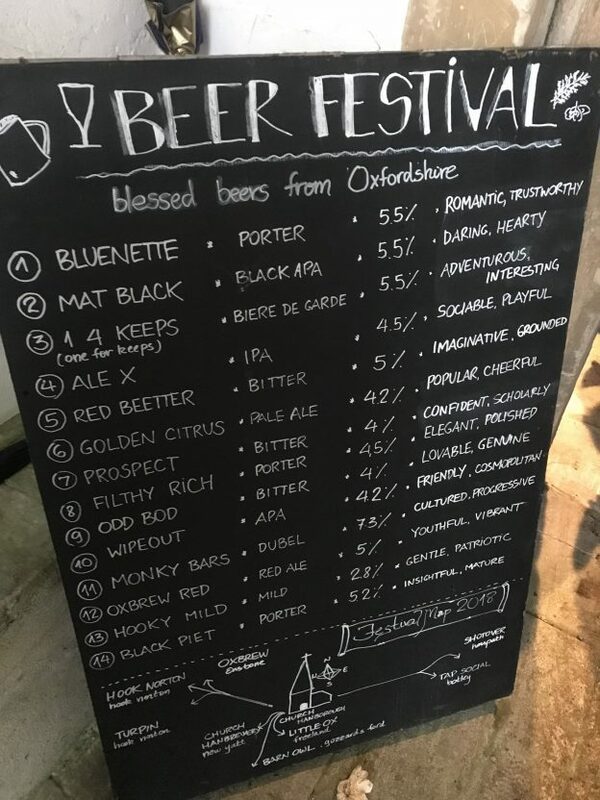 Our rather attractive hostess spoke a little like David Bowie leaving out letters and abbreviating words and I wondered if she had picked the habit up personally from the great glam rocker himself, but there was no time to think for we had a beer festival to get to. Richard drove down and George the steward placed us in a spot right near the church gate where Richard’s car would remain until the next day. We headed straight inside to be faced with my second sea of people that day for the church was literally standing room only. 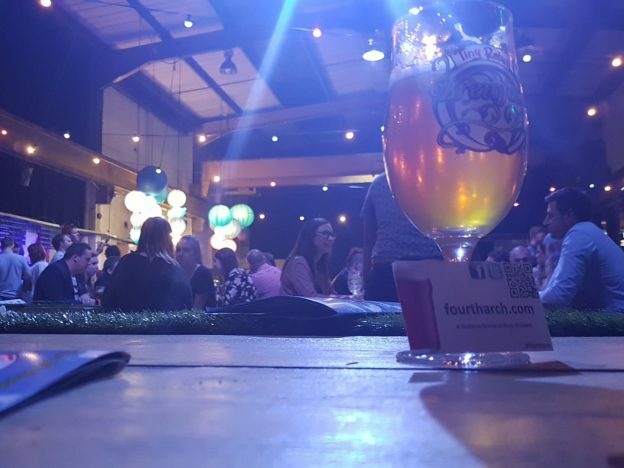 Emma and her team had created a fantastic atmosphere with lighting, live music and of course racks of real ale that we quickly signed up for by purchasing beer tokens and got sampling. It was hard to believe that an hour earlier Emma had been sat down at home looking relaxed with a cup of tea as if her next big job for the afternoon was to water the pot plants and not in fact overseeing what was in effect a 1960s style “Happening”. Drinking beer in a church seems to enhance the flavour similar to eating chips by the seaside and the festival was such an enjoyable experience the afternoon flew by enhanced by a variety of live musicians that ranged from a bit of “Eddie and the Hot Rods” through to a very talented young teenage lad who seemed to be in touch vis his guitar with his very soul. The word had gotten around that Matt and Richard were in town to help with house removals and we were all soon commandeered by Emma to set out lanterns along the church path as the light outside began to fade. As if planning a beer festival wasn’t enough for one day, Emma had also booked us in for a meal at the Hand and Shears pub opposite. For what time I cannot tell you for I decided to leave everything in Emma’s very capable hands and wait for instructions to simply walk across the road to the pub avoiding the traffic, sit down and enjoy excellent food and fine company. I was placed next to two young parishioners one of whom was an aspiring stand-up comedian who told me that he had lost his confidence but had recently got it back again. That all sounded like a script for the next Tom Cruise movie but he then went on to tell me that his comedy hero and inspiration was Billy Connelly, not a bad role model to have for Connelly has that gift to be able to find humour and colourful stories from life itself from his early days as a welder in the Scottish shipyards right through to old age. I can just about remember falling into a taxi for the road back to Long Hanborough where the evening was finished off back at Chris & Emma’s home with a rendition of The Twelve Days of Christmas with Matt on piano and Chris on the port. The next day after a perfect night’s sleep, all our dreams were realised, for having attended a beer festival the day before. we were presented with what was a brilliant breakfast at the B&B. While we ate, our hostess told us of her worries about the weight on the upper floor of the tiles we were asked to ignore in the entrance hall the day before. Matt took time out to inspect the acoustics and discuss with host Ramsay a very large old speaker sitting in the corner that looked like part of a sofa that could easily have come from the nearby Blenheim Palace – I wonder if Mr Churchill practiced his speeches with it. Matt, Richard, Emma and Chris had a church service to attend and various cars to reposition around the village so I decided to stroll down to the railway station for my train back into Oxford but hardly got out onto the main road when our B&B lady stopped in her car and insisted on giving me a lift, I asked her on route if she was off somewhere nice for the day “No” she replied “Just to pick up more tiles”. It was a wonderful weekend in what I am now going to call Hanborough over Fourtharch. This entry was posted in Uncategorized on March 27, 2018 by fourtharch. I joined Mogi, Richard and wife Claire back in October for a very pleasant Saturday evening at Crafty Devil in the Canton area of Cardiff where the conversation flowed happily alongside the beer and Claire looked especially at home that is always a good indicator of a comfortable atmosphere for me, the Crafty Devil staff were over generous with their welcome and certainly did not jump up to punch the air and shout a collective “YES” when the final bell rang behind the bar at the Chapter Arts Centre where we finished off the evening. It was after wishing designated driver Claire goodnight at Crafty Devil that I suggested to Richard and Mogi, who had never been there before that we pop around to the nearby Chapter arts centre for a nightcap, however I had an ulterior motive in mind for I wanted to check to see if this publically funded body set up in the 1970s was still there for the benefit of the staff only, things began looking good as I noticed that Chapter cinema now presents mainstream Hollywood films and has moved on from the dark days when the Chapter founding fathers believed they were not there to entertain in the arts but to inform and educate by inflicting such pretentious nonsense upon us as Federico Fellini’s 8½, I never saw the film but anyone who did always considered it to be 8½ too long. Back to 2017 now and with Mogi already aware of my views on Chapter we decided to use stickler for good service Richard [see his blog] as our Guinea Pig and it wasn’t long before he was faced with an obvious attitude beginning with barperson A who while serving us with our first round knocked a full pint and spilling some made no effort to top it back up again, barperson B for our second round actually took a taster of Richards beer while pouring it, finally bar person C looked at us like a collection of irritating pests who shouldn’t be encouraged when we failed to remove our pints fast enough from the drip tray after time was called and of course you already know about the last bell celebrations by bar persons A through G.
I felt that my experiment had been a success when both Richard and Mogi after only one visit vowed never to return to the arts centre ever again and I had proved to myself that the staff still work within an inherited culture embedded some 40 years ago that looked down upon the general public as art illiterate rabble to be tolerated just sufficient enough to keep council funding in place and even then only let in through the back door of what was the old Canton High School. The general public have become a lot more sophisticated these days and now have the confidence to question art so if a urinal [Marcel Duchamp 1917] bricks [Carl Andre 1972] and a shark in formaldehyde [Damien Hirst 1991] can be art then why not beer? 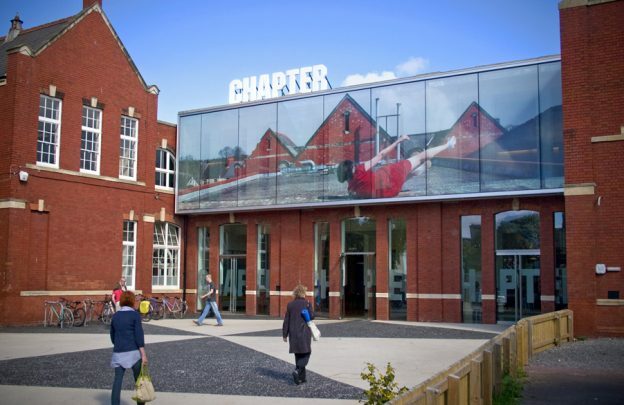 I didn’t actually see any “art” at the Chapter Arts Centre on that Saturday night and if anything there is more art and design to be seen and experienced in the new craft beer outlets so what with the private sector recently having moved in to run leisure centres in Cardiff why not now focus on art centres by straight away handing the Chapter bar over to the craft beer industry with the brewer as artist in residence, as for the “ambitious, multi-art form cultural space that presents and produces international art, performance and film alongside a dynamic social space” as quoted in the Chapter mission statement then why not turn that into a brewery – or am I being a crafty devil? This entry was posted in Uncategorized on February 19, 2018 by fourtharch. I can’t make up my mind what I think about breweries taking over other breweries beer. 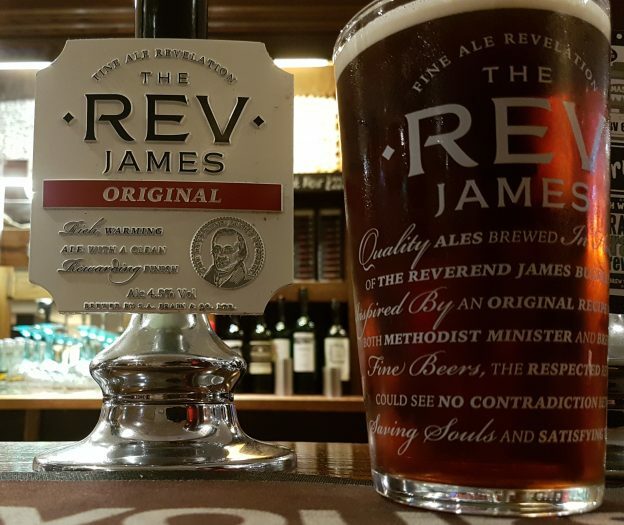 Part of me likes the fact that I can have a pint of Reverend James or Old Speckled Hen despite the fact that Buckley’s and Morland respectively don’t exist anymore. Somehow though, it just doesn’t feel quite right- it’s the idea of big business taking the successful beers and getting rid of the rest that doesn’t sit well with me. I think I could cope with the idea of the original brewery sites running but owned by someone else but when a beer moves physical brewery that doesn’t seem right. I know the recipe stays the same and the key bits are yeast, the hops and the malted barley, which should all stay the same, and the only change will be the water. I’ll leave brewers to debate how much difference the water makes to the taste but to take the recipe and then badge a beer as your own doesn’t sit will with me. It takes a bit of inspection looking at a Revered James clip to see the only reference to Buckley’s Brewery- it’s in the full name of the brewer that created it- Revered James Buckley. I’m sure he’d glad that his beer is still being brewed long after his passing but would he be happy knowing that it’s no longer the brewery that bears his name brewing it? This entry was posted in Uncategorized on November 2, 2017 by fourtharch. If you have already read my Beerexit blog complaining about the choice of beer in Portugal that is Superbock, Superbock or Superbock then I have an update for you as I truly believed salvation had arrived this September, in the form of Bohemia IPA that I came across for the first time in the big supermarket in Tavira on the Eastern Algarve. 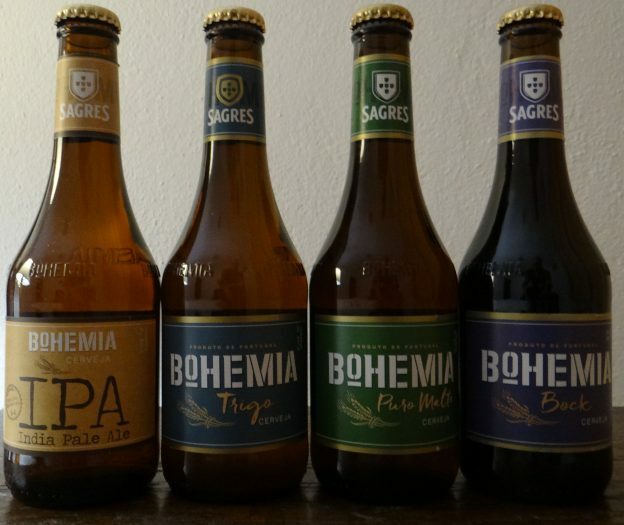 The beer is produced by Portuguese brewery Sagres who I consequently noticed had blitzed the town and therefore possibly the whole Algarve with one serious advertising campaign promoting the Bohemia range. With craft beers seriously eating into the profits of corporate giants Budweiser over in the United States, this looked very much like a preemptive strike by Sagres before the growing worldwide popularity of craft beer laps up against the Portuguese shore. Bohemia is an interesting choice of name for the brand, a Bohemian traditionally being someone who lives an unconventional lifestyle often involved in the arts and crafts – craft being the operative word here. The last known Bohemians were probably the handful of 1960s hippies who were still hanging around in the 1970s, one such example would be Sir Richard Branson who still likes to portray himself as living the Bohemian lifestyle on his desert Island but is in fact no different from all the other tax exiles based out in the Caribbean. 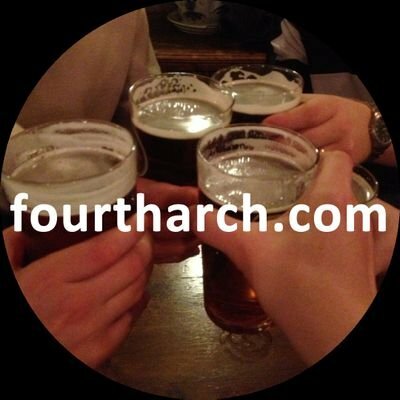 I am afraid this same illusion applies to Bohemia beer so not wishing to waste your time I will describe the 5 choices that I sampled in the range in very few words and as diplomatically as possible. Bohemia Trigo – Reminder of Kaliber – best poured straight down the sink. So there you have it, back to my default San Miguel next time as my quest to find good beer in Portugal continues – I still love the Portuguese and their country though! This entry was posted in Uncategorized on October 23, 2017 by fourtharch. I’m sure we used to call beer tasting “going down the pub” but with the growth in craft beer these events are becoming more popular. I do like beer tasting- clearly drinking beer being the best part of appreciating it. Apart from the obvious drinking beer bit though, I do enjoy the discussion about that beer. There is a culture emerging with craft beer that people are talking about beer and it is becoming less niche to talk about what hops were used, whether or not they were part of the brew or added as a dry hop. People are becoming more discerning about their beer and I find it fascinating to hear some of the back stories about how some of the beers were created. I was at a beer tasting at Small Bar in Cardiff recently and was hearing about the Rainbow Project which pairs breweries that come together to brew some experimental brews. 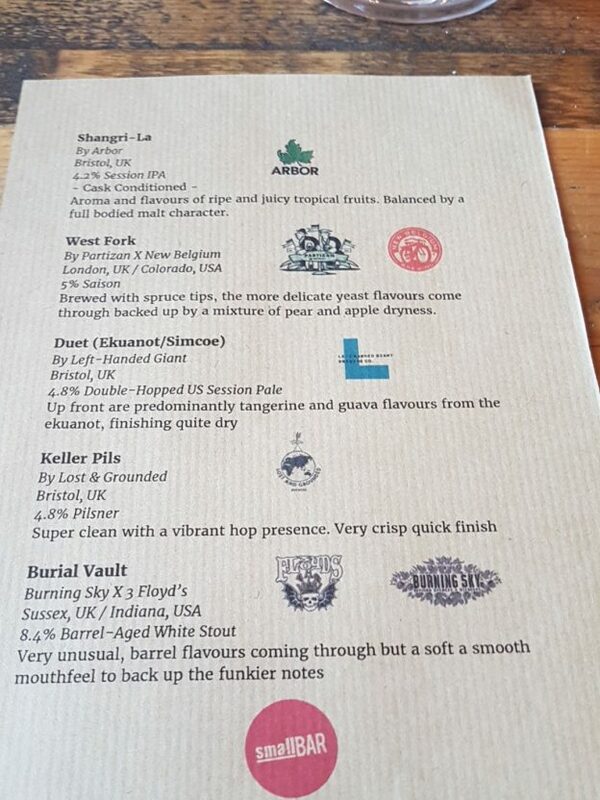 I did enjoy trying West Fork Saison by Partizan Brewery who we visited in 2015 on the Bermondsey Beer Mile and New Belgium, who in contrast I’d never heard of! We also had a (slightly heated!) debate about Buriel Vault, described as a “white stout”, brewed by Burning Sky and 3 Floyds as part of the same Rainbow Project. I can just about cope with the idea that a stout doesn’t have to be dark (well maybe..) but at the very least, it would have to taste like a stout. If someone were to create a beer using the right combination of flavours so that in a blind taste I would think it was a dark stout colour, then maybe I’d accept that as a white stout. A beer that tastes very much of the wooden barrel it was in and not of a rich malt, I’m afraid is not a stout. But the good news is that we live in a world where we can have that kind of a debate with fellow beer lovers! This entry was posted in Uncategorized on October 16, 2017 by fourtharch. A trip with two brewery tours deserves two blogs and we start with the first brewery of our annual trip, Theakston. Back in the 19th century, pubs would brew generally brew their own beer until the government encouraged beer drinking (including among children!) with the Beer Act in 1830. Robert Theakson took advantage of this and started expanding the brewing side of his business to sell to other local pubs. From there we get classic beers like Theakston’s Best Bitter and the famous (but deadly if you have a few!) Old Peculiar. There is something about having a beer that hasn’t travelled far and brewery tours are perfect for that. I did enjoy an Old P that close to the brewery, although it was only a third- partly to try a variety but also because it’s quite strong, it was just after the 11am tour and we had Black Sheep Brewery to follow! 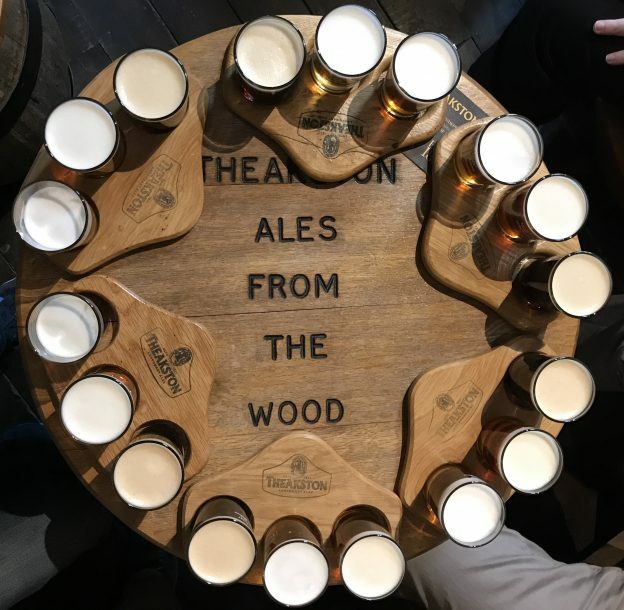 We like a traditional brewery and one of the things we most enjoyed about Theakston was right at the end where we discovered that they still employ a cooper making wooden casks by hand! If I understood the technicalities correctly, they are the only brewery in the country that has a hand craft cooper and he still makes casks that are used for the aforementioned Old P. The further good news is that he has an apprentice, which means the tradition will continue, which we thought was fantastic- highly recommend a tour of Theakston! This entry was posted in Uncategorized on October 5, 2017 by fourtharch. Where are we going in 2018 for our tenth annual trip? We will soon be off on our annual trip, to Yorkshire this year, for trip nine. It continues to be remarkable to those of us that were there for the start (photo above is the first trip) that a daft idea like this is still going. The point of our annual trip of course is to hear the announcement of where we are going the following year. Each member in turn gets to chose where we go the following year, what is amazing is that the group continues to grow and so no member yet has had a second choice. This year, Paul of Norfolk (possible hint there as to where he might take us!) will be announcing the location of our tenth trip. This years feature pub is the Black Sheep, which is the pub attached to Black Sheep Brewery in Masham and it is there (after two brewery tours earlier in the day!) that we find out where we are going in 2018. What this also does is give me an excuse to write a blog where I can include the photo’s from the eight trips to date. What I love when you see them in sequence is how you can see the membership grow over the years as our daft idea spreads! 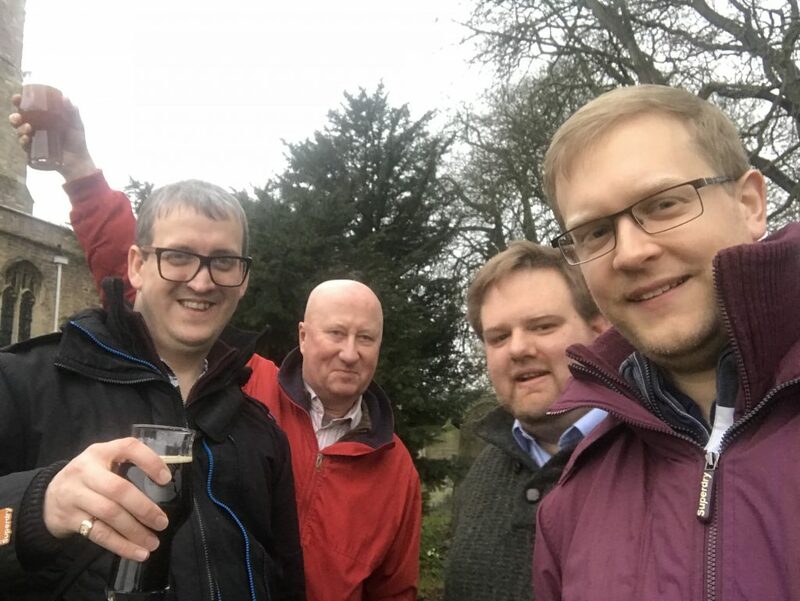 2012 Cheltenham played host to Team Fourth Arch in 2012 as we visited The Hollow Bottom in Gutting Power and Hook Norton Brewery- Gez’s choice this year. This entry was posted in Uncategorized on September 21, 2017 by fourtharch. Can I have a beer that tastes of errr beer? Call me an old git (I’m imagining at this point many readers are doing just that…) and I think I’ve been an old git pretty much since birth but I do like my beer to taste of beer. Hops, brewers liquor, malted barley and yeast = beer. It’s a simple idea that has worked for thousands of years. 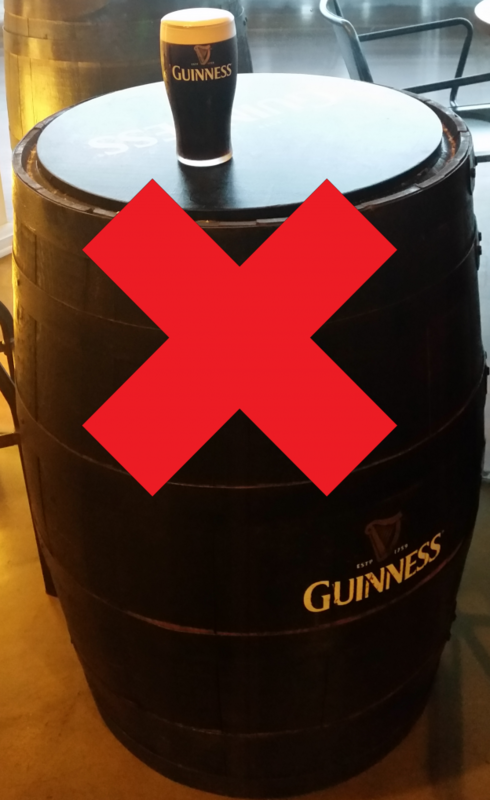 Why then do modern brewers seem to feel the need to put other ingredients into beer? A friend of mine (also an old git!) has a theory that you should avoid champion beers- the idea being that if anyone has brewed a champion beer, they’ve tried to do something different with it to make it stand out and has therefore buggered about with it and put something daft in it. It’s not a perfect theory, but I do think it has some truth in it. I’ve come across some champion beers that I could describe as interesting and very few that are examples of a best bitter done very well. Bizarre creations. I’ve not really defined it but a combination of fruit and others substances in beers and absurdly high ABV’s are the things I’m talking about. I have come across fruit beers that I quite like- I do like a Bacchus and I’ve come across some beers with ginger in them that work. I think there is a place in the world for a half of something interesting and strong at the end of the evening- Crafty Devil do a very nice coffee infused stout, Safe as Milk and a lethal version, Not so Safe as Milk that’s over 7%, that is very nice to end an evening. What I find strange though is exactly how many interesting creations there are and how few session beers there are out there. My personal beer preference is for a red ale with a malty flavour which tends to be a staple of traditional breweries but an endangered species amongst craft breweries- they do exist- Meantime do the very pleasant Yakima Red- but they are very rare. I’m happy to see new creations but I would like the world to also keep beer that tastes of beer and is somewhere in the 4% range that I can drink in a pint glass!! This entry was posted in Uncategorized on September 7, 2017 by fourtharch.